Those planning to switch away from HSFO to low sulfur fuels as part of their IMO 2020 compliance strategy should start their tanks cleaning no later than June 2019, Olivier Baiwir, CEO of Aderco, has advised. Baiwir, whose company manufactures an assortment of fuel treatments including those used for tank cleaning, also advises that planning for the switchover should begin now. "There is no time for ship owners, ship managers and operators to lose in getting their vessels ready for the IMO sulphur cap. The regulations come into force in little over 12 months but there have to be preparations well in advance of this to ensure compliance," he says. "We have been telling our customers that tank cleaning ideally needs to start no later than June 2019 to ensure they do not fall foul of the new regulations. This is the most pressing task before any new fuel blends can be introduced into their tanks and using a fuel treatment is the easiest, most cost effective and assured way of keeping a ship at sea and completing this vital task." Baiwir notes that documenting the preparations may also be a requirement, as among various matters to be discussed at the upcoming 73rd session of IMO's Marine Environment Protection Committee (MEPC73), are proposals for vessels to have a log of actions taken that records the first loading of compliant fuel, the fuel tank cleaning process, and assessments of the new fuels on engines and machinery. 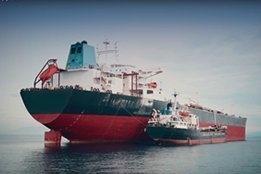 Aderco has also produced an video discussing IMO 2020 and the importance of tank cleaning before any new fuel is added to a ship's tanks. "Time is not on the side of owners and operators as they need to start planning now for their tanks to be cleaned and ordering fuel treatment ready for the June 2019 start of this process," says Baiwir.